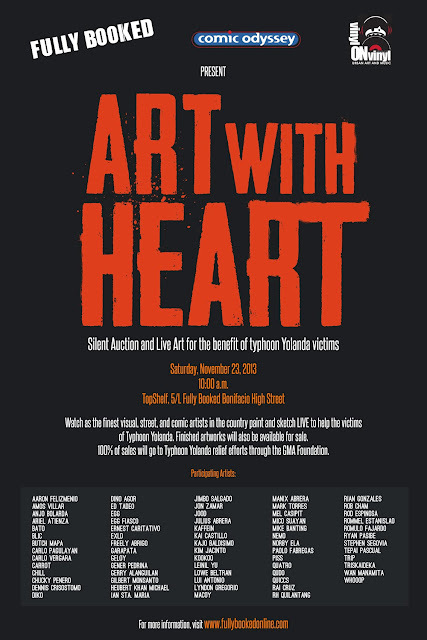 VINYL ON VINYL: ART WITH HEART: Silent Auction and Live Art for Typhoon Yolanda Victims, this Saturday, Nov 23! ART WITH HEART: Silent Auction and Live Art for Typhoon Yolanda Victims, this Saturday, Nov 23! Fully Booked, Comic Odyssey and Vinyl on Vinyl present ART WITH HEART: Silent Auction and Live Art for Typhoon Yolanda Victims. Visual, street and comic artists come together to sketch and paint live to help relief efforts of the recent typhoon. Commission a sketch, purchase merchandise, and participate in the silent auction featuring many beautiful Original Comic Art pieces donated by both artists as well as comic fans. Visual and street artists will also be painting and selling the finished pieces. 100% of sales will support relief efforts via the GMA Kapuso Foundation.